This beaded bracelet will look perfect on you whether you're dressing up or dressing down. Made by bead artist, Laura Ramirez, this loomed piece is woven with hand selected Delica beads and will elicit "oohs" and "aahs" whenever you have it on. 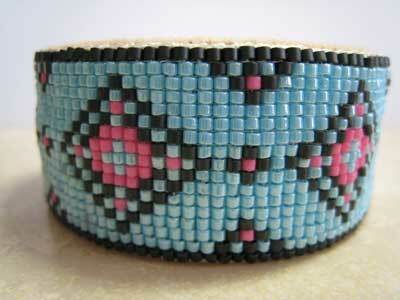 Beaded cuff bracelet measures 1 inch tall by 6.5 inches wide. It's light and flexible which means it will easily bend to fit your wrist. Since each piece is unique, if you like this beaded bracelet, don't hesitate ... buy it now because there will never be another one exactly like it.